Clinton Woods will fight Tavoris Cloud for the IBF light heavyweight world title later this year, BBC Radio Sheffield confirms. The news comes after Chad Dawson relinquished the title because he did not want to make a mandatory defence. 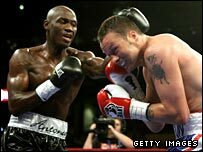 Woods' promoter Dennis Hobson said that means that now opens the door for the 37-year-old to regain the belt he lost to Antonio Tarver 13 months ago. "Clinton fought a final eliminator and that has paid off," he said. Woods beat Elvir Muriqi in Jersey to move second in the IBF rankings and now setting up the chance to fight for the now vacated belt. Hobson said: "We don't know where it's going to be yet, I spoke to Tavoris Cloud's people and we get on very well, but it is business and we will both be trying to get the best deal for our man. "Hopefully Clinton will do the business this time whether it's here or in the States and he rightfully regains his title. "August is a dead month in boxing and there is not a lot going off so I think September time, but the IBF will want to get it turned around in the short term."